The game doesn't follow this rule because it takes away the atmosphere if you can't hear anything. Why does AVC report this as v1.1 despite the fact that it's very clearly v4.1 in the RCSSounds.version file? Awesome, i can't tell you how much this mod makes a difference in luna-er... MUNar landing scenarios to hear that satisfying 'PFFT.. PFFFFFFT.. pft.. pf....PFT' as you are averting certain doom on your final approach. 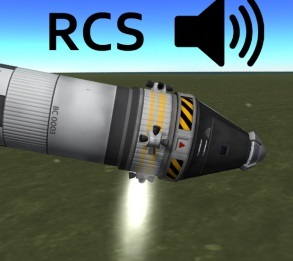 RCS is a type of rocket engine, so this mod gives it sounds to go along with the rest of the rocket engines. One of my other mods, Atmospheric Sound Enhancement, takes away the sounds from all rocket engines when in a vacuum. Actually this mod (if I read correctly) has the option to have the sounds only play when in internal view. Inside the spacecraft you'd likely hear it via sound conduction through the hull of the ship. I know I'm being nit-picky, but sound can travel through anything that has mass, so it doesn't HAVE to be oxygen! Extract the zip into your main KSP directory. There are full instructions in the readme.